How Paintings Were Ranked by the Academies of Fine Art. the dull polish of academic painting. NOTE: For analysis of paintings from all the genres, up to 1800, please see: Famous Paintings Analyzed (1250-1800). For later works, see: Analysis of Modern Paintings (1800-2000). In fine art, the term 'genre' refers to the differing 'type' or 'category' into which a painting may be classified. Rather confusingly the same word appears in the phrase 'genre painting' which is itself a type of painting - specifically, pictures of everyday scenes. The established painting genres are: Landscape, Portraiture, Genre-Scenes, History, and Still Life. Over the centuries, debate has raged over the relative value and importance of these painting categories, and whether there is a natural hierarchy among them. This method of 'ranking' paintings according to 'type' was established in the wake of the Italian Renaissance by the great European Academies, like the Academy of Art in Rome, the Academy of Art in Florence, the French Academy in Paris, and the Royal Academy in London. It was first announced in 1669, by the art-theoretician Andre Felibien, Secretary to the French Academy. Felibien ranked the genres as follows: (1) History Painting; (2) Portraiture; (3) Genre Painting; (4) Landscapes; (5) Still Life. anti-Academy leader of French Realism. This ranking system - based on traditions of Greek and Roman art established during the era of the Florentine Renaissance - was used by the academies as a basis for awarding prizes and scholarships as well as spaces in their exhibitions (Salons). It also had a significant impact on the perceived monetary value of an artwork, in the sale rooms of auction houses. According to the precepts of Academic art this so-called 'hierarchy of the genres' was justified because it reflected the inherent moral force of each genre. An artist could communicate a moral message much more clearly through a history picture, a portrait or a genre painting, rather than a landscape or still life. In addition, following the traditions of classical antiquity, the Italian Renaissance believed that the highest form of art was the pictorial representation of the human form - in figurative sculpture, figure drawing and figure painting. Thus landscapes and still-lifes - which required no human figures - were viewed as lesser genres. Lastly, the Academic ranking system reflected each category's display value. History painting was the largest and most suitable genre for public disply, followed by portraiture, genre-works and landscapes, while still life canvases were typically the smallest and executed for domestic viewing only. The Academic ranking system aroused considerable controversy and discontent among artists and schools. To begin with, it was accompanied by a series of other rules, which dictated how paintings were to be painted. For example, a painting's theme, layout, composition, colour scheme and finish was carefully regulated by academies, to reinforce the system of aesthetics for which they stood. Artists who did not comply with these conventions found it extremely difficult to forge a career as an artist. They were, for instance, excluded from the Paris Salon, and from any list of 'recommended artists' for official posts in teaching, or for any official commissions. Secondly, the insistence of the academies on ranking a painting according to its ability to convey a 'moral message' introduced a completely un-artistic element, into the practice of art. As a result, mediocre history paintings received preferential treatment over outstanding landscapes and genre paintings. Even worse, the whole system discouraged experimentation and innovation, preferring instead conformity and repetition. 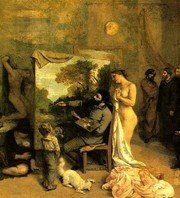 Later, during the 19th century, the whole academic system gradually fell into disrepute as brilliant (but non-conforming) artists - such as Manet, Monet and Cezanne - were excluded from the Paris Salon, while lesser figures had their works exhibited. (Note: Almost no history paintings were produced by Impressionist painters.) Such was the controversy that in 1863 the French Emperor Napoleon III organized an 'alternative' salon - known as the Salon des Refusés - to exhibit works rejected by the French Academy. NOTE: For more about the development of painting, sculpture and other fine arts, please see: History of Art (from 800 BCE). History painting, the highest category, sometimes called the 'grande genre' - denoted paintings that portrayed an edifying or ethically uplifting message set in a historical, religious, allegorical or mythological context. For centuries, the most common examples of this genre were religious paintings, which was hardly surprising since the Church was the principal paymaster. Examples of history painting include: Allegory of Good and Bad Government (1338-9) by Ambrogio Lorenzetti; the Scrovegni Chapel frescoes at Padua (1304-13) by Giotto; Battle of San Romano (1438-55) by Paolo Uccello; the Last Supper (1495-98) by Leonardo da Vinci; the Genesis fresco (1508-11) by Michelangelo; Jupiter and Io (1533) by Correggio; and Supper at Emmaus (1601) by Caravaggio. Modern history paintings include pictures like: the Death of Marat (1793) and Oath of the Horatii (1785) by Jacques-Louis David; the Midnight Ride of Paul Revere (1931) by Grant Wood; and Guernica (1937) by Pablo Picasso. Portrait art, the second highest genre, included primarily the painting of heroic individuals larger-than-life for public viewing, although it lent itself also to smaller-scale private portraiture, as well as self-portraits. Famous Renaissance portraits include: the Arnolfini Portrait (1434) by Jan van Eyck; Portrait of a Young Girl (1470) by Petrus Christus; Old Man with a Young Boy (1490) by Domenico Ghirlandaio; Doge Leonardo Loredan (1504) by Giovanni Bellini; Mona Lisa (1503) by Leonardo; and Portrait of Baldassare Castiglione (1515) by Raphael. For 17th century portraiture, see The Laughing Cavalier (1624) by Frans Hals; Portrait of Jan Six (1654) and The Syndics of the Cloth-Makers Guild (1662) by Rembrandt; Portrait of Pope Innocent X (1650) by Velazquez; and Girl with a Pearl Earring (1666) by Jan Vermeer; for more, see also Baroque Portraits (1600-1700). 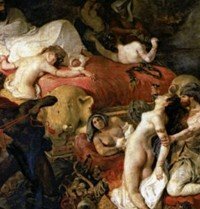 For 18th century portraits, see: Rococo and Neoclassical Portraits (1760-1850). For 19th century portraiture, see: Portraits: Nineteenth Century and also Impressionist Portraits (1870-1930). For 20th century portraits see: Boy with a Pipe (1905) and Weeping Woman (1937) by Pablo Picasso. For more, see: Portraits by Picasso (1900-44). See also: Expressionist Portraits, such as Portrait of Juan Gris (1915) by Modigliani; and Portrait of Madeleine Castaing (1928) by Chaim Soutine. For a semi-abstract work, see: Seated Woman (1944) by Willem de Kooning. For examples of contemporary portraits, see: Mr and Mrs Clark (1970) by David Hockney, as well as the range of celebrity silkscreen Pop-art portraits by Andy Warhol. Genre-painting concerned everyday scenes populated by ordinary people, although they might include landscape. While history and portrait pictures were ideally large (and displayed in public), genre artworks were small-scale paintings for domestic viewing. The Dutch Realist school of genre painting, led by Jan Vermeer, was the supreme exponent of this genre: see, in particular, The Milkmaid (1658), Little Street (1658), Young Woman with a Water Jug (1662), Woman Holding a Balance (1662-3), Woman with a Pearl Necklace (1662), and The Lacemaker (1670). In France, outstanding Baroque genre painters included: Georges de La Tour, and the Le Nain Brothers (Antoine, Louis, Mathieu). They were followed by Jean-Antoine Watteau (1684-1721), noted for his Pilgrimage to Cythera (1717), as well as Jean Chardin (1699-1779), Francois Boucher (1703-70), Jean-Baptiste Greuze (1725-1805) and Jean Honore Fragonard (1732-1806). In England, the leading genre artist was William Hogarth (1697-1764), famous for works like Rake's Progress (1735) and Marriage a la Mode (1743). 19th-Century genre painting is exemplified by works like: A Burial at Ornans (1850) by Gustave Courbet; Derby Day (1856-8) by WP Frith; The Gleaners (1857) by Millet; La Grenouillere (1869) by Monet; The Floor Planers (1875) by Caillebotte; The Dance Class (1873-5) and the Absinthe Drinker (1876) by Degas; Dance at the Moulin de la Galette (1876) and Luncheon of the Boating Party (1880-1) by Renoir; A Bar at the Folies-Bergere (1882) by Manet; Bathers at Asnieres (1884) and Sunday Afternoon on La Grande Jatte (1886) by Georges Seurat; At The Moulin Rouge (1892) by Toulouse-Lautrec; The Card Players (1893) by Paul Cezanne; The Green Blouse (1919) and The Terrace at Vernon (1939) by Pierre Bonnard. Landscape painting, the fourth category, denoted paintings whose main theme was the portrayal of a scenic view (countryside, seascape, rivers, mountains, townscape etc) for its own sake. 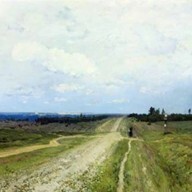 A landscape required no people, and a peopled landscape might be classified as a genre painting, if the artist was mainly concerned with portraying human action. This genre only took off in the late 18th century, as a topographical exercise. It wasn't until the arrival of Constable and Turner - and the impact of the Industrial Revolution - that scenery for its own sake became a popular art form. Important schools included: English Landscape Painting (1700-1900), the Barbizon School (1830-75) and Impressionist Landscape Painting (1860-1920). Famous landscape paintings include: Entrance to the Grand Canal, Venice (1741) by Bernardo Bellotto; The Hay Wain (1821) by John Constable; Snow Storm: Steamboat off a Harbour's Mouth (1842) by Turner; Ville d'Avray (c.1867) by Corot; Impression Sunrise (1873), Poppy Field Argenteuil (1873), Water Lilies series (1897-1926), The Water Lily Pond: Green Harmony (1899) by Claude Monet; Misty Morning (1874) and Snow at Louveciennes (1878) by Alfred Sisley; Red Roofs (1877) by Camille Pissaro; and Cezanne's celebrated series of Mont Sainte-Victoire paintings (1882-1906). 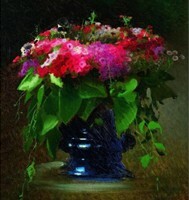 Still Life painting was considered to be the least elevating of all the genres. Typically, it concerned the representation of of objects such as flowers, fruits, foodstuffs as well as kitchen and table implements. Animals and humans might also be included. The school of Dutch Realism was the supreme exponent of still life art. Its achievements, including the subtle insertion of Christian morality into works of "Vanitas painting", are exemplified by the paintings of artists such as: Frans Snyders, Pieter Claesz, Willem Claesz Heda, Willem Kalf, Samuel Hoogstraten, Jan Davidsz de Heem and Rachel Ruysch. Outside Holland, the leading still life artists have been Francisco de Zurbaran, Juan Sanchez Cotan, Jean Chardin, Paul Cezanne, Henri Fantin-Latour, Georges Braque, Juan Gris, Giorgio Morandi and Ivan Kramskoy.  For more about different categories of painting, see: Homepage.